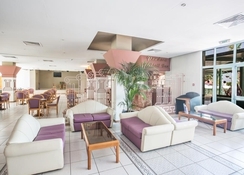 Antigoni Hotel provides guests with an exceptional stay with excellent facilities, comfortable rooms and an amazing location with easy access to restaurants, family nights out and the beach. 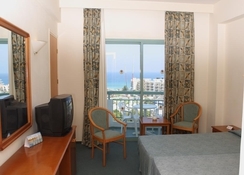 Antigoni Hotel can be reached from Larnaca International Airport in under an hour. Situated in the relatively quieter but no less beautiful region of Protaras, guests can enjoy natural beauty spots such as Sunrise Beach, considered one of Cyprus’s top beaches and Cape Greco National Forest which has verdant lush forest and runs along the stunning rugged south-east coast of Cyprus. The Ocean Aquarium and the Magic Dancing Waters Live Show also make for unique family days out. And there is a myriad of excellent restaurants all within easy walking distance. Back at Antigoni Hotel, guests can enjoy the swimming pool, tennis, basketball and volleyball courts as well as the sauna and massage. Guest rooms are well decorated and furnished and there are convenient hotel services such as porter service, room service, money exchange, babysitting and much more. 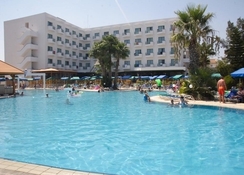 Antigoni Hotel is just 64km from Larnaca International Airport. The nearest beach, Sunrise Beach is a short 500-metre walk away. Antigoni Hotel is surrounded by fantastic bars and restaurants just a few meters from the hotel mostly found along Protara Road. There is also a supermarket which is just a two-minute walk from the hotel. Exciting entertainment such as the Magic Dancing Waters Live Show, a unique experience sits practically next door to the hotel and is a very short walk. Whilst there is some retail shopping, the majority of shopping and conveniences such as cash points are mainly found a few miles north. Rooms at Antigoni Hotel are clean, comfortable and a pleasure to stay in. They balance a neutral light colour scheme that maximises the Cypriot sunlight by creating a brighter atmosphere. All rooms come furnished with essentials such as air-conditioning, T.V., international electricity outlet, safe deposit box, tea and coffee facilities and much more. All rooms feature either a private balcony or terrace with views looking out over either the pool, garden, street or the sea. Standard rooms typically sleep two guests whilst Family rooms sleep up to four guests and are generally more spacious. 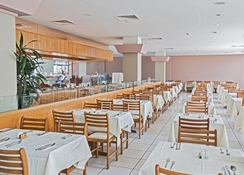 Antigoni Hotel has a themed buffet restaurant serving international and local dishes. There are three bars including one poolside which have a wide range of great alcoholic and non-alcoholic beverages. Top places to wine and dine are easy to come by and easy to get to from Antigoni Hotel. Enjoy the evening with a delicious and refreshing drink at the fun Ghetto Cocktail Bar or try the Rockafellas Sportsbars which has bar games and live sport. Try one of the many great restaurants such as authentic traditional Mediterranean cuisine at Andama Tavern, delicious Italian favourites at Marcello’s and Greek meze at The Corner Restaurant among many others. Chill out or stay active, both options are available to guests staying at Antigoni Hotel. Here, you will find an outdoor swimming pool with a separate pool for children. Head to the gym to keep up your exercise plan or perhaps you’d prefer staying active by playing tennis, basketball or volleyball? Unwind with a massage or steam bath. There is a daily entertainment programme which puts on family friendly events during the daytime and evening periods that features live music and folkloric shows among other events. The not-to-be-missed Magic Dancing Waters Live Show will provide a spectacular night for all the family and would be a crime to miss, not least of all because it’s just a two-minute walk away. And of course, there’s the local beach, Sunrise Beach, which is considered one of Cyprus’s finest. 64km from Larnaca International Airport.